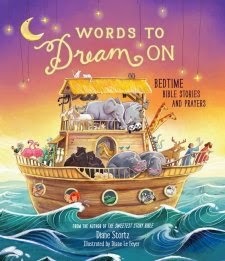 Words to Dream On: Bedtime Stories and Prayers is a wonderful children's book filled with over 50 stories of the Bible, including the Old and New Testament. Each story has a bedtime blessing, a verse to dream on, and a good night prayer. The beginning and the end of the book also comes with some ideas and tips on reading to your child and bedtime routines. This is a children's book but the writing and beautiful illustrations make it a perfect book to enjoy with your child or grandchild! If your kids are anything like mine, they will think of anything to try to stay awake and not go to bed! 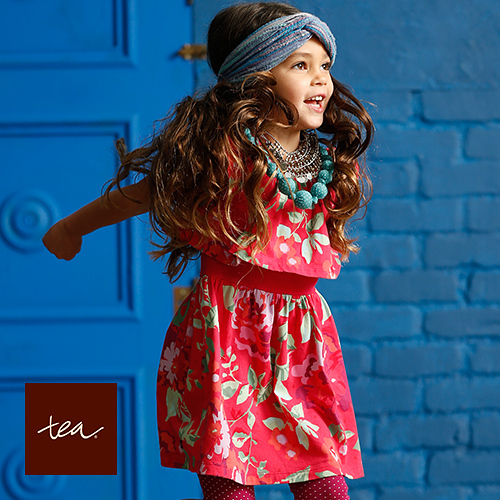 One of our favorite bedtime routines is to read a story and then say a prayer. This book has an awesome concept because it combines not only those two things, but also throws in a Biblical verse to know and a Bedtime blessing! My sons who are three and five years old, very much enjoyed hearing their favorite Bible stories before going to sleep. The author picked each of the stories to show "God's loving care and His trustworthiness, power and protection." I could not think of a better way to go sleep than to be reminded of that, and I would definitely recommend this book as a must have on your child's bookshelf! Thank you for reading my book review of Words to Dream On: Bedtime Stories and Prayers by: Diane Stortz and illustrated by: Diane Le Feyer. You may check out a description for the book, find out more about the authors and other reviews on this book here. We had a light week this week as we had dentist appointments on Tuesday for the boys, a field trip to the Duels at Daytona on Thursday, and Friday was Daddy's birthday! 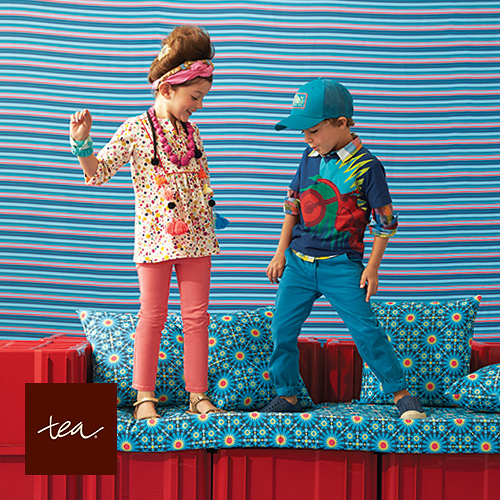 We had a fun week and I'm glad you are here to share our week! If you would like to see what curriculum and resources we are using, please click here. This is what about 20 cars going over 150 mph looks like! It is literally that fast in person. On TV, the race looks really slow but when you see it live, the sound of the cars going by your face is incredible and all you see is a blur of color go by. Race cars going through inspection. Monday - We read "Pierre" and B did Lesson 69 in "100 Easy Lessons." His new sounds and words were wh, gold, fill, hand and teach. We also read about "God's Mighty Prophets: Isaiah Meets God" in "Jesus Calling," going over Isaiah 6:9. Wednesday - G did Lesson 64 - Reading: Fun with the Alphabet, Lesson 67 - Reading Words on the Farm, Part 1 and Lesson 66 - More Alphabet Fun on ABCmouse, finishing his lesson path at 88% for the year! Monday - B drew pictures of his favorite Avengers characters and the boys played outside. Thursday - We went on our field trip to the Duels at Daytona for Daddy's birthday so we did massive amounts of walking! We went into the Fun Zone and the boys were able to play basketball, football, and basketball with some bouncy house fun. They also colored paper cars. Saturday - B did Lesson 69 - Reading Words in Music and went over the violin, trumpet, guitar, drum, and xylophone. Monday - B answered reading comprehension questions and the boys had a friend come over. We also went to the library for a program on learning about bees, and some of their friend were there. Thursday - Nascar is developing something called "Nascar Innovation" where it seems it is implementing STEM to have children learn. The boys were able to play a game where a board lit up with colors and they had to hit the corresponding color, they were able to spin a big wheel to win a prize, hit a button to win prizes on a big screen TV, and look inside a race car. This is the trophy at the winner's circle. Saturday - We played The Game of Life in our Family Game Night. Monday - B wrote D, sh and d.
Monday - The boys watched the Leap Frog video "Numbers Ahoy." Wednesday - B did Lesson 68 - Math: 1 to 10 Again. Thursday - While waiting for the race to start, the boys went over the numbers on each of the seats in our row. Saturday - We played Sorry. 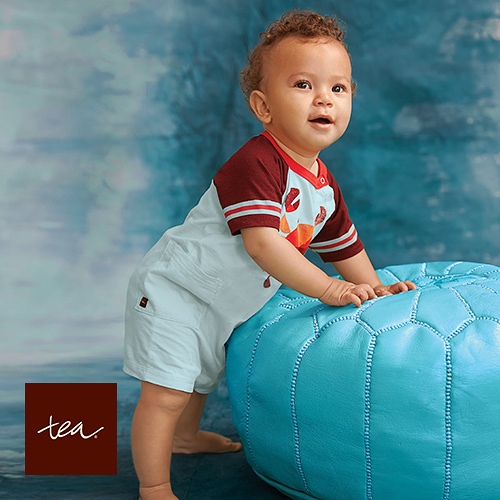 This helps the boys with their 1 to 1 ratio in counting the spaces. Monday - Our library had an awesome program on learning about bees. They had a glass case where you could see the Queen bee and the male bees, called drones. The average life span of a bee is 6 weeks, the Queen lays over 1500 eggs a day, and the honey bee is almost endangered which would affect food supplies because of their pollination. The boys were able to sample 4 different types of honey and see the equipment used in collecting honey. Thursday - The boys were able to see the inside of race car and also the engine. We went into the Fun Zone where you get to see the inspection of the cars, the garages where the team works, and we got to see the beautiful Clydesdale horses and Dalmatian that Budweiser uses in their advertising. B's favorite racer, Danica Patrick's garage. Saturday - B did Lesson 70 - The World Around Us: More Sports! and finished at 80% of his lessons for the year. I have been fighting getting an iPad for the longest time, but this week I finally bought one! I have noticed that many of the educational apps are only accessible on the iPad and I thought for homeschooling, this gives the boys a chance to discover different methods of learning. 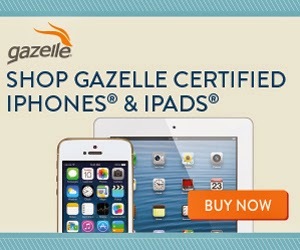 One of my affiliates is Gazelle and they offer many different certified devices, including iPads! They also offer great deals on mobile devices. **FTC Disclosure Statement: This post contains affiliate links which means that I may receive a commission if you click a link and make a purchase. For further information, please see my disclosure here. You can read these three books (along with many other titles) online for free at We Give Books. To see what curriculum and resources we are using that are not featured on this post, please click here. Monday - B did Lesson 67 in "100 Easy Lessons" and his new sounds and words were j, come, ever, never, leave, live, and must. We also read "The Snowy Day," "Goodnight Goon," and "Llama Llama Misses Mama" online at We Give Books. 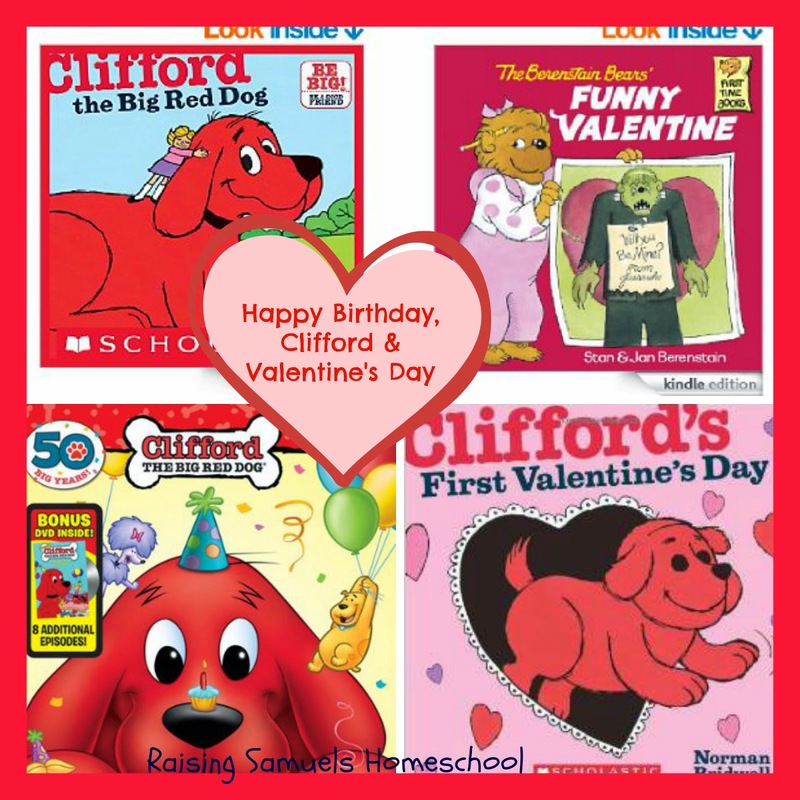 Wednesday -Today, we had a Library Day and the librarian read "Clifford the Big Red Dog" and "Clifford's First Valentine's Day," and then watched a short segment of "Celebrate with Clifford." The boys also learned about Joshua and Jericho tonight at RA and GA's at church. Thursday - B did Lesson 68 in "100 Easy Lessons" and his new sounds and words were every, broke, start and men. The boys also learned about David and Goliath ("Stones, Slings and Giant Things") in the free Bible for Kids app. Friday - The boys and I read "Miss Bindergarten Gets Ready for Kindergarten," "The Berenstain Bears' Funny Valentine," and "Thank you, God, For Everything." They also learned about Queen Esther in Bible for Kids app. Monday - B drew fish on the Scholastic Counting Mats as we were doing math lesson. Tuesday - G did Lesson 63 on ABCmouse, which was learning about Art - A Rainbow of Colors. Wednesday - At the library, the librarian taught the boys the finger plays "Five Little Bees," "In the Garden," and "This Little Turtle." Friday - We did some stamp art as we made a Valentine's Day card for Daddy. Then we went outside for a bike ride. Monday - B answered some reading comprehension questions and G put the puzzle pieces together for the math lesson, where we used Brain Quest Add & Subtract, a Christmas present from Grandma and Grandpa! Tuesday - The boys played games and puzzles on ABCmouse. Wednesday - We sang Happy Birthday to Clifford at the library, and the librarian handed out Clifford bookmarks and birthday cards and heart lollipops as favors. They played with one of their library friends on the computers afterward, and later built the Wall of Jericho out of marshmallows at church. Thursday - B answered reading comprehension questions. Friday - We played Game 1 of Fry's First 100 Words Snake and Ladders from Clever Classroom, an amazing free printable game. The boys had a blast reviewing Fry words and trying to win the game! Monday - B wrote B, p, 7 and 5. Tuesday - B wrote We, Love, You, Mom, Dad, and signed his name and brother's name. Thursday - B wrote er and J.
Friday - Dear, Dad, I, Love, You and signed his name and brother's name. Monday - We used Scholastic Counting Mats and Brain Quest Add & Subtract for learning about addition and subtraction. Tuesday - G did Lesson 62: Math - Patterns and B did Lesson 66: Math - Ovals & Hearts on ABCmouse. Wednesday - We did the "Five Little Bees" finger play at the library and counted from 1-5. Friday - We read "There Were Ten in the Bed" and counted from 10 to zero, and then played Sorry. We also did the Missing Number Free Printable for Valentine's Day from Life Over C's. Monday - Today, we read the Ranger Rick Jr. February 2015 edition and learned about Blue Footed Booby's and Flamingos. Tuesday - B did Lesson 65: World Around Us - I Love Sports on ABCmouse. That's our week! Hopefully I will be able to have this week's lessons up by the weekend. It's been a crazy few weeks getting settled into our home and in a new church but I appreciate you for stopping by and sharing our week with us! 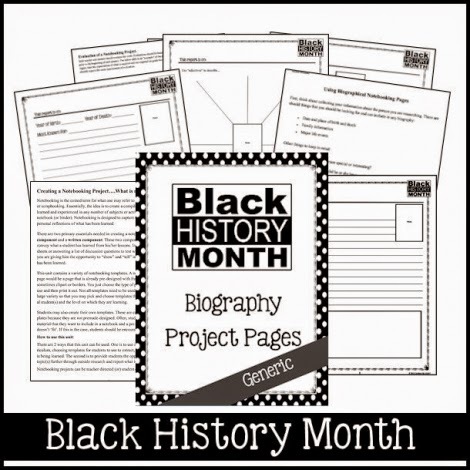 Black History Notebooking Pages - Save $2.50! 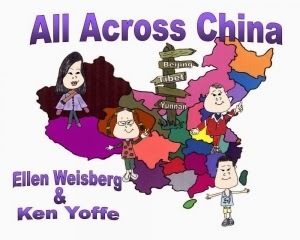 All About China Unit Study - Save $3.00! Monday - We read about Adam and Eve, Jonah, and Samson in "Jesus Calling." B also did Lesson 66 in "100 Easy Lessons" and his new words and sounds were must, side, walk, wet and car. Tuesday - Today, we read "How to Make a Cherry Pie and See the U.S.A." and "Circle, Square, Moose." Wednesday - We had a Library Day today and the librarian read "The Little Brute Family" and "Bedtime for Frances," and then got to watch the video "Bear Snores On." Thursday - We read "The Very Hungry Caterpillar" after our fun exercise for Math and Physical Education! Friday - Daddy and G started to work on his phonics by playing with Learning Resources Alphabet Puzzle Cards and A+ Learn the Alphabet Flash Cards. The boys then watched the videos "Make Way for Ducklings" and "Leap Frog Letter Factory." Tuesday - The boys played outside on the playground. Wednesday - At the library, the boys learned "In the Garden" finger play and danced to "Sally the Swinging Snake." Afterwards, we went to this amazing park that is not too far from our house. 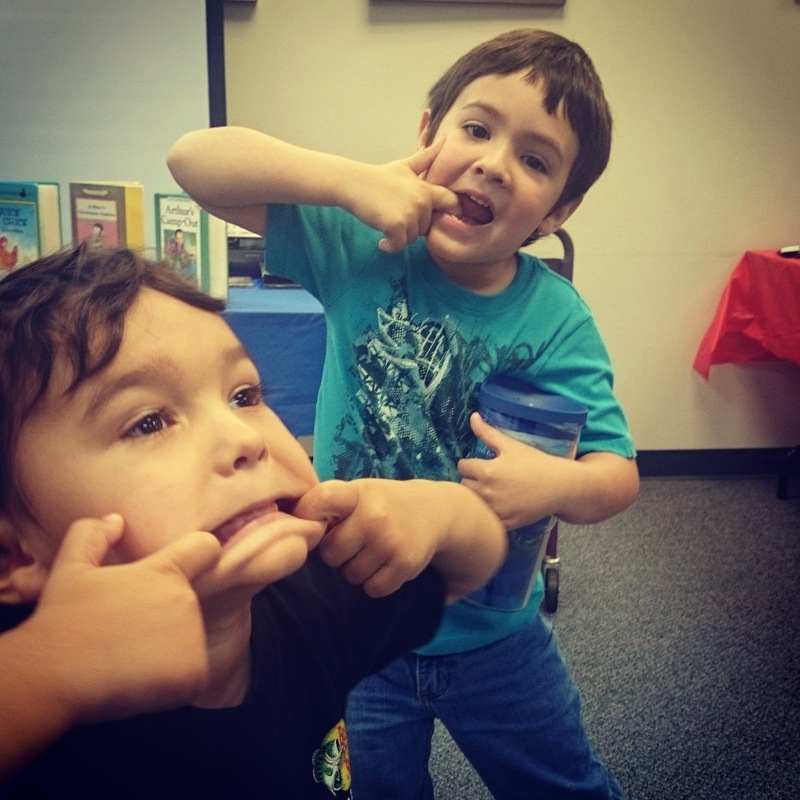 Silly boys at the library! 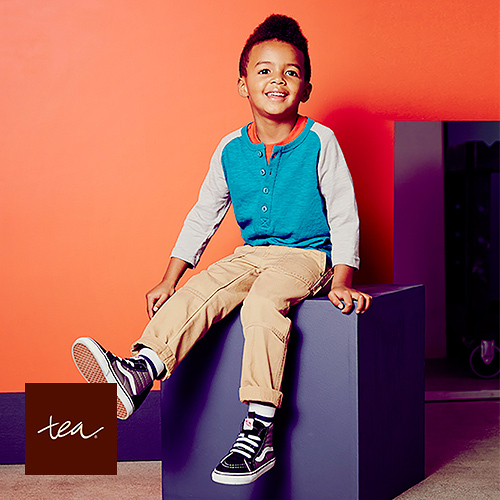 Thursday - I downloaded the numbers from Create a Wall Chart: Skip Counting by 5's and 10's to 100 on Liz's Early Learning Spot and set up a hopscotch game for the boys like I saw on 100th Day of School Ideas for Kindergarten on Kinder Craze. The boys also had a fun idea to set up the numbers to make it look like a caterpillar, and then they skipped and jumped on the number caterpillar! They colored the 5's black and blue, and then colored the 10's green. Friday - B did Lesson 63 Art: Pink on ABCmouse and then the boys played outside. Tuesday - The boys played with friends outside and G worked on some games on NickJr.com. Wednesday - We have started to make friends with some of the parents and children who go to the Library Time and all of us decided to go to the park near the library afterward. It's been so nice to make friends for both me and the boys in our new town! Thursday - B cut out the numbers from the Create a Wall Chart printable. Friday - They had a play date with some of their friends in the neighborhood. Monday - B wrote sh, y, grass, ground, under and nuts. Monday - Playing the game "Sorry" helped teach them how many spaces to go and listen to directions of the game. They also played "Groundhog Roll and Color" from the Almost February printables where they had to roll the dice, and then color what the description of that number was. G also did Lesson 59 Math: Rectangles, Diamonds and Stars on ABCmouse. Tuesday - We made Banana Bread and made our first loaf of regular bread! The boys love helping me bake and cook and don't realize they are learning measurements at the same time! Wednesday - The librarian taught the boys "Five Little Bees" finger play and they had to count from 1-5. Thursday - For our hopscotch game, I made the boys put the numbers in order to 100 by 10's. 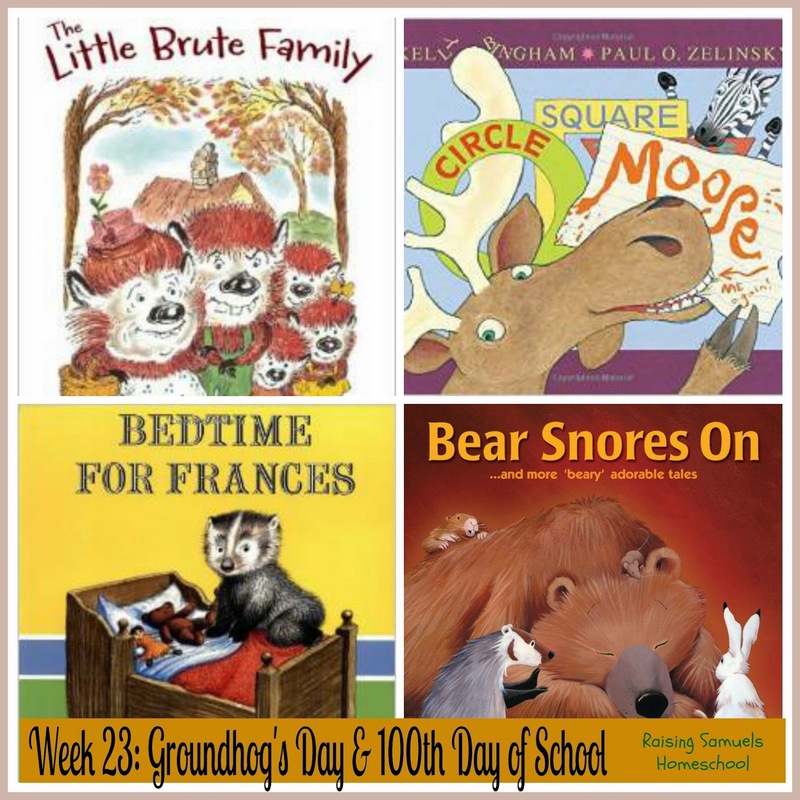 Monday - We learned many vocabulary words from the Groundhog's Day booklet, inlcuding mammal and rodent, and what they like to eat, they live underground in burrows, and they are similar to squirrels. G also worked on Lesson 60 The World Around Us: Happy Birthday of ABCmouse and finished at 80% for his year path. Tuesday - The boys were fascinated to see the yeast rise in our bread making. Wednesday - We learned about badgers during Library Time and that they look like a skunk with their stripe, they are mean underground animals with sharp claws, they sit low to the ground, are fat, and they go to sleep (called hibernating) in the winter. Thursday - We went to a vintage warehouse today to look for a desk and a breakfast nook set, and the boys got to see a 1950's refrigerator and an old wood burning stove. They couldn't get over how tiny they were to what we have in kitchens now. Friday - We had a windy day today so it was the perfect time to fly a kite. Grandpa got the boys an eagle kite a while ago, and it was funny to see how the eagle kite looked like it was flapping it's wings! 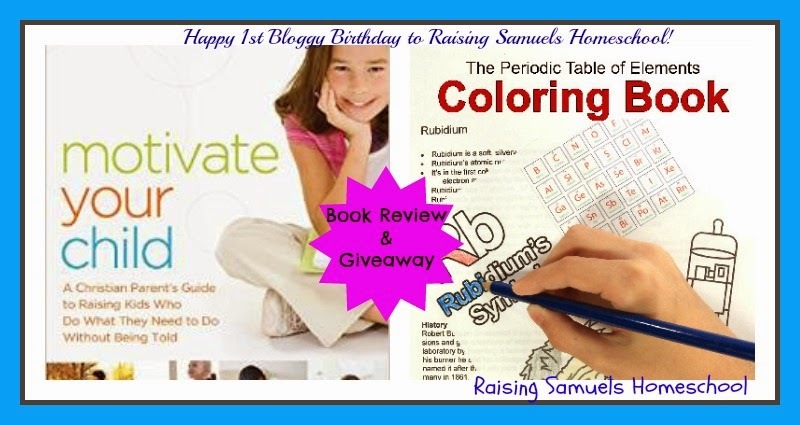 Happy 1st Bloggy Birthday to Raising Samuels Homeschool! A year ago this month, I had about 250 page views as I had not made my blog public yet. I am proud to say that I now have over 13,000 page views which may not sound like a lot to some bloggers, but I know the hard work it took me to get here. I was blessed to be a part of two contributor blogs last year, Satisfaction Through Christ and Sew Crafty Angel. I was also awarded The Liebster Award for up and coming blogs. It is still a learning experience for me as I dig deeper into what I want the message of my blog to represent and finding better ways to have a more clean design. Hopefully, I will be able to do this by the summer. My goal is to one day be able to speak at conventions and write a book. It's been wonderful getting to network with others and for my readers to get to know me and what I am about. I appreciate all of you and your support! For right now, I am going to continue to share our homeschool stories, events, field trips and places to find amazing curriculum and resources for free or discounted. I also enjoy writing inspirational articles about how God is working in my life, to help encourage others. I have also started to do product reviews recently, and am thankful for the companies and people who send their hard work and efforts to me for an honest review. 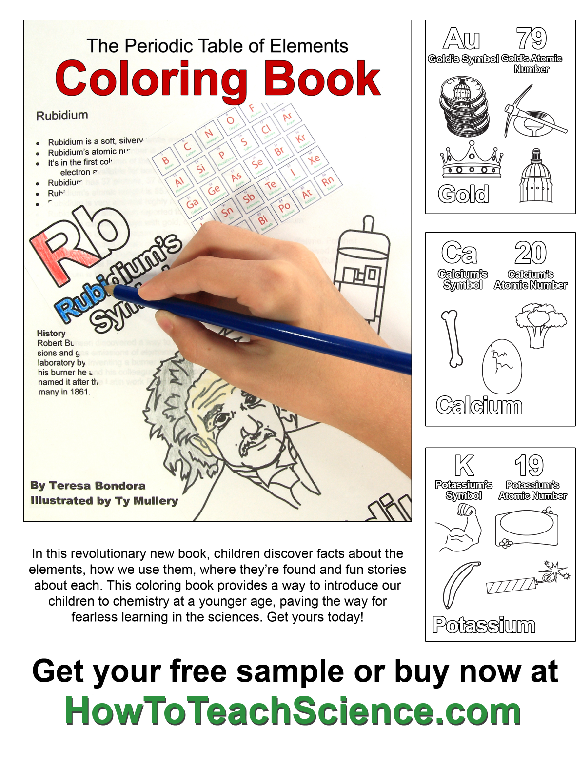 I was given a complimentary copy of The Periodic Table of Elements Coloring Book by: Teresa Bondora for an honest review. I started researching how to homeschool and curriculum when my oldest was three. I had a calling from the Lord to be at home and educate my sons. Almost three years later, I consider myself an expert at finding fun and noteworthy material to help teach my sons. 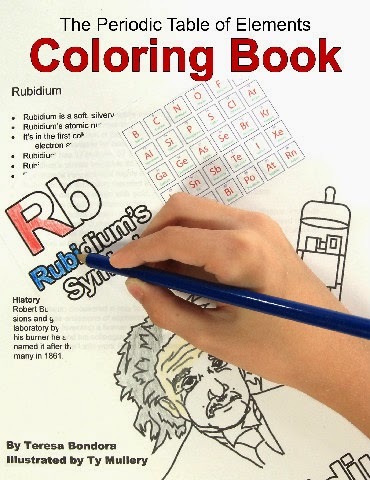 I received that and more with Teresa Bondora's book The Periodic Table of Elements Coloring Book. When I was younger, I was taught the first thing you do when you look at a book is to turn it over on the back and see what it is about. On the back of this amazing book, is an endorsement from the infamous Janice VanCleave, a household name for science to any homeschool Mom or educator! I knew this book would be outstanding with an endorsement like that! The author Teresa Bondora, is also a homeschool Mom but she was a high school science teacher for 8 years before this, and was distressed out how science was taught. She has also worked with special education children and was able to convey her love of science to have the children understand the concept behind the Periodic Table. She didn't understand why Chemistry was not introduced until middle or high school and why so many parents and educators were afraid to teach this subject to their children and students. Click on the picture above or here to get directed to where Teresa is offering a free sample of what is included in the book! I remember starting Chemistry in the seventh grade and how much everyone dreaded it, including me. I would have loved to have this book and have someone break it down the way Teresa does. You can see the amount of hard work and time she put into making this book. It's a wonderful book because it can be applied to a child of any age starting at the age of 5, to 4th and 5th graders and also middle school and high school students. There are two pages per element. On one side is a description and facts of the element, and at the bottom is a brief history of who discovered the element and how it came to be. I was so excited to see this! Not only are you getting the science behind it, but she also provides a history so you can use this book for science and social studies! On the opposite page, are illustrations by: Ty Mullery for your child to color and relate more to the element in a visual sense. The possibilities with this book are endless! 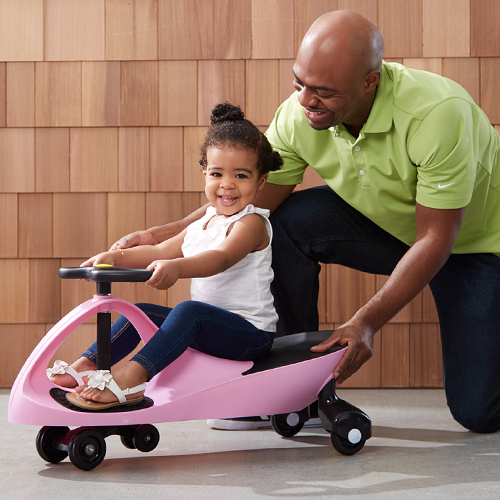 It is designed for an elementary level but it is such a powerful tool that you can use with your child or student for the length of their academic path. Teresa has done a fantastic job of taking something as scary as the words Chemistry and Periodic Table of Elements, and making it real and teachable to students, parents, and educators alike! I would highly recommend this book to any homeschooler or educator! Teresa, thank you for letting me review this book for you and for giving me such an awesome component to learning for my sons! If you would like to find out more information on science lessons by Teresa, check out her website at HowToTeachScience.com or her other products at her TeachersPayTeachers store. Giveaway Expired: Time for a Giveaway! To thank you all for your support of my blog and to help celebrate my 1st Bloggy Birthday, I am offering a giveaway! I was blessed to be included in a launch team for the new parenting book called Motivate Your Child by: Dr. Scott Turansky and Joanne Miller, RN, BSN. I also received an additional copy of the book as part of the launch team from the publisher, so that is the giveaway today! 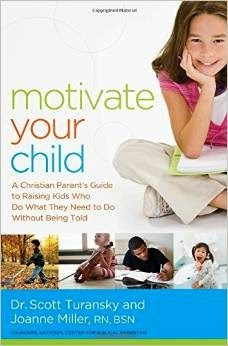 There will be one winner of the giveaway, and the winner will receive a copy of Motivate Your Child via mail so I will need your address to send it out, but your information will not be shared with any other parties. Psalm 23 is a children's board book that goes over Psalm 23, line by line on each page. 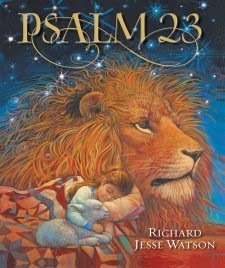 The illustrations are gorgeous, and make it very easy to have a child understand what the Psalm is about. The book is meant for a child, but I think any adult reading this book to a child would enjoy it as well because of the beautiful Psalm and the rich pictures. This is my husband's favorite Psalm, so he especially loved reading this book to our children. It is perfect to teach for memorization of this Psalm, because each page contains a short piece of the Psalm. We are a homeschool family and I am looking forward to both of my sons knowing this Psalm, for how close it is to their father's heart. The pictures depict animals, children, skies, meadows and an angel so it is also a wonderful book to read and snuggle with your children or grandchildren as well. Thank you for reading my book review of Psalm 23 Illustrated by: Richard Jesse Watson. You may check out a description for the book, authors and other reviews here. We had a terrific homeschool this week and had our first field trip for the year at Dinosaur World! (Thank you Aunt Ashley and family for the passes!) Hope you enjoy the pictures and I've listed some amazing books we read to find out more about dinosaurs! We also hit our 100th day of school this week so I'm hoping to have some fun 100 Day Activities for next week. We also opted to take Friday off and did homeschool on Saturday instead. My oldest son unfortunately also had his first experience with peer pressure. Tuesday - Today, we read "Charlie Cook's Favorite Book." Wednesday - We had a Library Day today and our librairan read "Owl Moon," "How Do Dinsoaurs Say Good Night," "Hoptoad" and "Mama's Kiss." 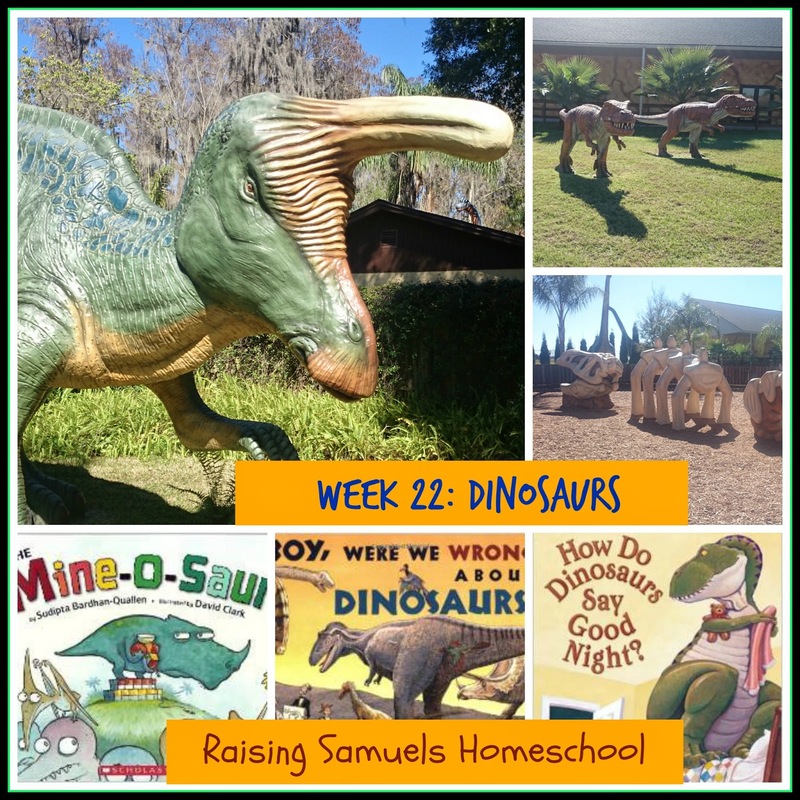 Thursday - The boys and I read "Dangerous Dinos," "The Mine-O-Saur," "Boy, Were We Wrong About Dinosaurs!," and B did Lesson 65 in "100 Easy Lessons." His new words and sounds were oo, over, eagle, be, made and shore. Saturday - B worked on Lesson 61 Reading the Alphabet with Words on ABCmouse. Monday - G worked on Lesson 54 Art Secondary Colors Everywhere on ABCmouse. Wednesday - The boys had fun dancing to "Sally the Swinging Snake" at the Library and then we went to Dinosaur World, where we walked along the paths and played on the dinosaur playground. Thursday - The boys played outside and on the playground with their friend. Monday - My sister-in-law's mom gave the boys many of her old board games and we were so thankful! It was like Christmas at our house when we brought the games in! Today, I taught the boys to play Twister and it was perfect for left and right correlation, and color review! My oldest son also learned a hard lesson today about friendship. Some of the kids in our new neighborhood have no parents watching them so they are allowed to do and say whatever they like. They are a few years older than my boys also so today they decided to teach my 5 year old about profanity. Our neighbor behind us realized it and came and told my husband right away. He went out and talked with the neighborhood boys while I talked with my son. It was really hard because he knew it was wrong, but he said the bad words so the boys would be his friends. I told him boys like that are not friends and that we needed to pray for them. I also told him about a similar time when I was little and I was confronted with the same peer pressure. The neighborhood kids are now acting more respectful and know they are not going to be able to act like this when my sons are at the playground. It's amazing as a homeschool parent, how my boys still ran into peer pressure but I was thankful for the lesson my son learned. Tuesday - The boys played on their Leap Pad 3 and learned how to make a grilled cheese sandwich and grilled peanut butter and jelly from their game. They also built some Legos with their friends. Wednesday - We had a wonderful field trip! The boys got to dig for fossils, practice being a paleontologist with a fossil brush in the sand, they played a game where they had to guess what type of dinosaur it was by touch and feel. We watched a show and found out some interesting facts about dinosaurs. Thursday - B had reading comprehension questions to answer. Saturday - The boys played games and puzzles today on ABCmouse. They also had a blast because their cousins came over to play and some of their friends. Tuesday - B has been so excited about spelling and writing lately! Today, he wrote in, pin, yes, no, pog, got, let, get, pigs, moves, words, wow, fun, sun, bun, rat, mat, bat, cat, fat, that and tea. Thursday - B wrote goats, bun, d, er, this and that. Monday - G did Lesson 53 Math More Counting 1-10 and B did Lesson 59 Math Add Diamonds and Stars on ABCmouse. Tuesday - The boys watched both Leap Frog videos of "Math Adventures to the Moon" and "Counting on Lemonade." Saturday - B completed Lesson 62 Just a Bit More 1-10 on ABCmouse and finished the week at 70% for the year. Monday - G did Lesson 52 Reading All About Horses and B did lessons on the World Around Us: Seasons Part 1 (Lesson 57) and Part 2 (Lesson 60). Wednesday - We saw a show at Dinosaur World today on how it can take 3-6 months for paleontologists to uncover a T-Rex skull. They learned about the vocabulary words fossil and paleontologist. We learned interesting dinosaur facts as we saw the sculptures of what they may have looked like. Thursday - We learned more science vocabulary reading the books today such as omnivore, herbivore, carnivore, crest, and tail. We learned about many types of dinosaurs and G finished the days with a lesson on penguins on ABCmouse. Saturday - G did Lesson 58 on the World Around Us Pets and finished the week at 78% for his learning path year. 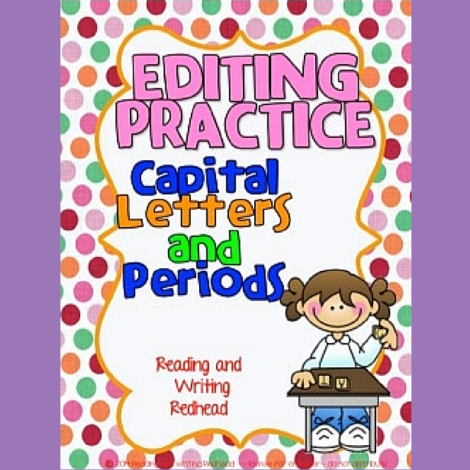 Editing Practice Capital Letters and Periods - "This is a one-page downloadable editing sheet where children will look for capitals and periods that need to be fixed." 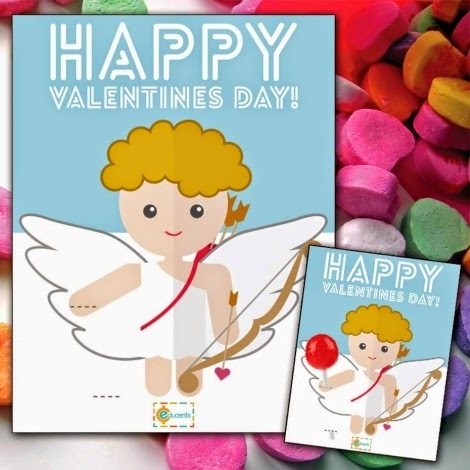 Printable Valetnines Day Card- "Download, print, and add a treat to your Valentine's Day gift with this FREE card!"